I don’t write much about what I cook and eat. Here’s a first. Tonight I will be making Stuffed Bell Peppers. Not the first time I have made this and it is very simple. Tomatoes, TVP, a few spices that I am in the mood for, a little worcestershire (No, not common worcestershire, I prefer Annie’s Naturals brand.) and, of course, bell peppers. I just ran out of fresh from the garden bell peppers so I picked up two organic ones from Wild Oats, actually a deal at $2.49 a pound as opposed to what they usually go for. Mashed Potatoes is always a great side and it will be there tonight as well, but I have some fennel that I picked up from Whole Foods this weekend as a “Let’s try something new.” thing. I’ll probably sautee that to go along. I am the pet of three cats. If you have cats you understand that statement. This includes one stray that adopted us. These cats eat all day, or they would if I fed them all day. The food they eat is, of course, an animal-based food. Cats are natural carnivores, they will not survive from a vegetable only diet no matter what you read. Feeding them so will lead to blindness and death. So this leads me to ask, are vegans truly vegan if they purchase and feed to an animal they keep animal-based food? I think so, but others disagree and believe cats can be healthy eating a plant-based diet. Others have thought the same but changed position. Urinary tract problems are extremely common in cats and, because of the relative acidity of meat to vegetable protein, many vegan cats suffer from them. Although we have been giving advice for some time on how these problems can be minimized while still feeding a completely vegan diet, we have found that the vast majority of our customers have not been following this advice. Unless you are very committed to following the advice outlined below, we therefore recommend that you mitigate the risk of urinary tract problems by feeding males cats only a 25-75% vegan diet and females a 50-100% vegan diet. Why would anyone risk harm to an animal by forcing a diet their bodies are not designed to subsist from? That is NOT vegan. 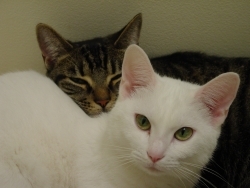 Are keeping cats, or any other pet, vegan? This is another question I have seen asked, but not often. Let’s take for instance, the stray we have. Venus is an outside cat, she has a nice warm place to sleep here and gets fed 3 times daily. She gets attention and has a home. If we did not take her in she may have been dead at this point, starvation or even hit by a car in search of food. We have done our part to help this animal. The other two cats we have that stay inside are similar but they were not strays, they were chosen by us from a litter of kittens someone had to give away 7 years ago. They too are fed 3 times a day and have a warm place to sleep. Where would they be if not here with us? In harm’s way or dead? I am helping these cats survive. One of those mindless rambles but I have three mouthy cats that made me think about it. 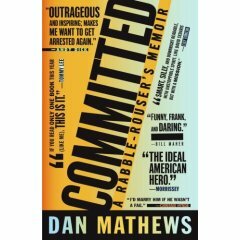 Dan Mathews, Vice PResident of PETA was at the Barnes & Noble at Coolsprings today signing his book “Committed”. After listening to him speak I think that this site might need a little different direction. Food is an important part of any vegan or vegetarian but most veg*ns would agree that animal welfare makes a big part of assuming that lifestyle. I will not take away any part of this site that caters to the eats but I want to dedicate more to animals and the horrors of factory farming and animal abuse to show more people that it not just about the tofu. If anyone has ideas or suggestions please share. 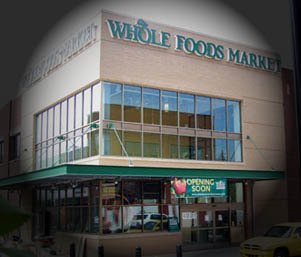 We were at the new Whole Foods in the Hill Center at 8 am yesterday, many more people were there than I expected. The line doubled around the corner for the free breakfast. After the bread breaking (Whole Foods’ way of doing a ribbon-cutting), we were the first in the door. Everything was as I expected from the other Whole Foods locations. One standout is the Olive Oil/Balsamic Vinegar tasting station, bottles line the shelves and slices of bread are supplied for you to try almost any vinegar or oil available. One thing that I really liked was finding Organic Valley Unsweetened Soymilk and finally not having to purchase Silk any longer. I even spoke with one lady for a few minutes and noticed she had about 10 half-gallon cartons of Silk in her cart I told her about Dean Foods which owns Silk. I saw her soon after putting all of her Silk back on the shelf, right beside the Silk representative that was there! I get laughs in silly, vindictive ways. I spoke with Laura Button, owner of Journey To Bliss Foods, who was giving out some great samples of her products. My daughter loved the Carrot Cake. For those wondering, plenty of local products can be found throughout the store and a brochure is even provided to give more information. One thing I saw that was unlike any other Whole Foods was the cafe was located outside of the cash registers. As well, there was far more outside seating available than I have seen at other locations. When we were leaving (after returning for the third time) we walked by a lady who was complaining to management about the traffic and parking situation. She went on and on and just would take any explanation as good enough. One management member even walked her through the parking garage to help her understand the best way to enter and leave. We made it a point ot walk up to the same management and thank them for bringing Whole Foods here and told them we had zero complaints. My mother said she went back inside 30 minutes later and the same lady was complaining to someone else about the same thing. Of course, this will be my new hangout when I have nothing better to do.